In a clear attempt at capitalizing on a new generation's interest in an old generation's format, Queen's entire studio catalog is getting a re-release ... on vinyl. 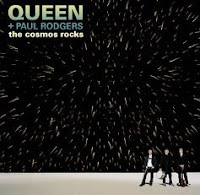 In an unclear attempt at capitalizing on a legacy name in danger of tarnish, Queen + Paul Rodgers (- Freddie Mercury) have a new album available: The Cosmos Rocks. Hmm. Finally, what is it with me + equations today?